JPs on the Gold Coast are given a useful set of aides memoire laminated flip cards. For compact snippets of information like the wording of oaths, list of document types and the sequence of steps in a short process these flip cards are invaluable. Where the process is more complicated and needs to be spread over many cards I find the flip cards less convenient. I like to have an overview of the process on a single sheet in front of me. 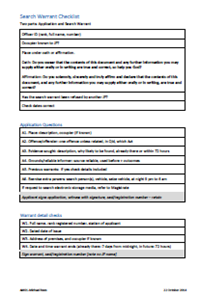 So I have started producing checklists on single sheets and my first is for search warrants. I used the JP branch 'red' book and the QJA 'yellow' book as guides as well as talking with fellow JPs. Note that these checklists are my personal summaries and carry no formal status. In practice for my own use I print the A4 page reduced to A5 and laminate that to have in front of me while talking with the police officer or other official. I have created a new page to hold documents like this called Aides-memoire and Checklists. Updated 5 November 2014 as a result of a communication from the JP branch the link to this document has been withdrawn.